Community organizer Alain Cisneros talks to Rockport Apartment residents about the damage to their homes following Tropical Storm Harvey. Houston Going into Beaumont on Interstate 10, one exit after another was still closed off. Water was still standing. Trailers in a park near a small lake were still submerged with water coming up to the shoulder of the highway. Spotted along the route in one random location after another were abandoned cars and trucks, some with hoods propped up, some in the middle of the median, and others seeming to have almost made it to high ground, but then flooded. Coming into Houston city limits on the north side of I-10, trash heaps, dumpsters, and tractor trailer rigs were now the landmarks. The giant Fiesta grocery store that was once our rendezvous point for driving into town to see the Astros play, was now a clean-out and construction zone. Motels were lined up with doors swung open and heaps of trash in their lots. Once in town, everything seemed almost normal in the city center. Talking to one storm refugee, he commented that he was flooded out and got out of his apartment after hours of bailing and waiting for the end and realizing that the water just kept rising, but once out of his place, he couldn’t see a pattern. One building would be gone and another untouched. Much of the Houston recovery tragedy is invisible from the highway of course. 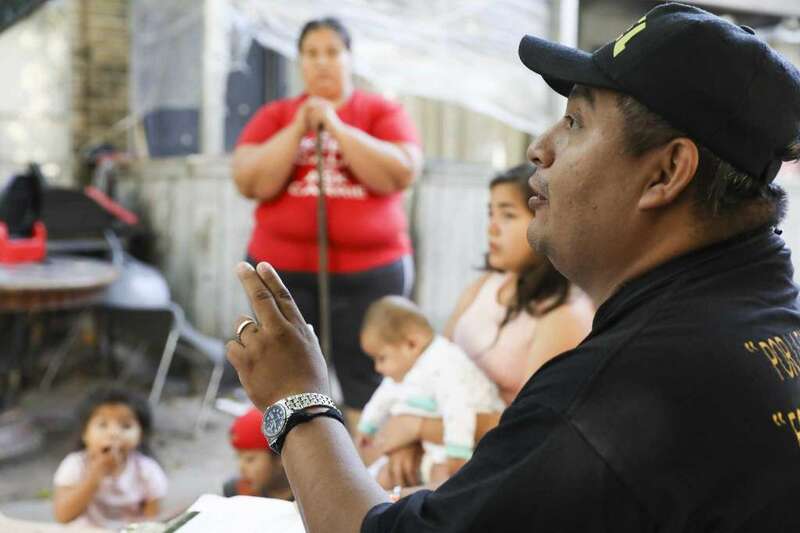 I talked to Alain Cisnerous and Caesar Espinoza with F.I.E.L., which in Spanish is Familias Immigrantes y Estudiantes en La Lucha or Immigrant Families and Students in Struggle. The organization had been founded a decade ago with the original mission of helping immigrant students figure out financing to afford college, but had more recently focused on DACA and more general issues facing the immigrant community. Needless to say their plate was already overflowing their capacity. And, then comes Harvey. They told me stories that were outrageous. In southwest Houston, a largely Hispanic area in many sections with thousands of apartment complexes, flooding had been severe. FIEL had visited with families trying to escape the water who had gone to the upper floors of their buildings for shelter and found they were nothing but shells, framed with wooden studs. Families that ended up at the convention center and elsewhere with apartments that were uninhabitable were getting texts and calls from their landlords about rent payments and late fees that would double their normal payments. In one case, a family unable to return would now owe $1200 a month because of fees and penalties on rent that had been $500. This is outrageous. I asked whether Houston’s progressive and well-regarded mayor, Sylvester Turner, had jawboned the Apartment Association on the issue of opening up vacant units for the displaced and waiving rent and fees for abandoned units. They answered, no. Mayors and New Orleans and Houston had done so after Katrina for refugees. Why not Houston’s own people who are now under the gun? Had banks offered forbearance to mortgage payers who were underwater, literally, and waived foreclosures? Once again, they indicated nothing had been done like this to their knowledge, though ACORN had easily been able to win a number of six month extensions after Katrina. Was there a daily meeting in the Mayor’s office to coordinate the recovery, like Houston’s former mayor, Bill White, had organized? Was there a coalition of nonprofits making sure that equitable plans were produced for rebuilding and distributing relief money? No, no, not that anyone I met knew. There is probably a lot of this happening somewhere at some level, but it definitely has not sunk down to the grassroots where FIEL and others are working. Lessons have to be learned from disasters, but I was disturbed in Houston that so many of them were so easily being forgotten. This entry was posted in Citizen Wealth, Community Organizing, Financial Justice, immigration reform and tagged Alain Cisnerous, Beaumont, Caesar Espinoza, FIEL, flooding, houston, immigrants by Wade. Bookmark the permalink.